Care to top this? Submit your caption(s) via comments or email at: missheather (at) thatgreenpointblog (dot) com. 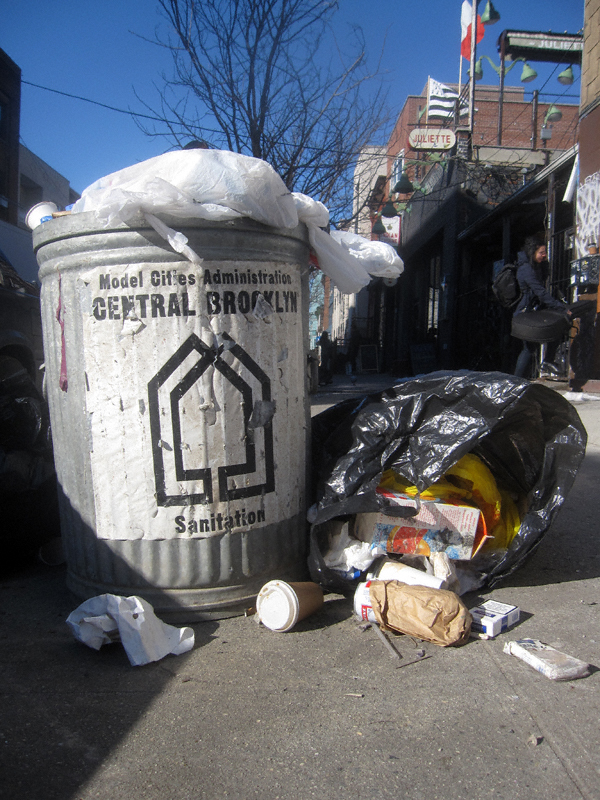 Here’s the problem-that garbage can is clearly marked “Central Brooklyn”. There’s probably a trash can somewhere in Flatbush marked “North Brooklyn,” and if you just move it to Bedford Avenue that li’l corner of Williamsburg will be sparklin’ in no time! Here’s my question, Rheingold: does Prospect Heights qualify as being “Central Brooklyn”? The reason I ask is as far as I know “Sesame Street” was based off of Prospect Heights. I’m guessing Oscar decided to pay Williamsburg a visit, went “Bill Murray” and got rolled. Think about it: somewhere in 11211 there could be a very naked and hung-over grouch!